Consumer prices in Germany rose 2.3% in September compared to the same month last year, the Federal Statistical Office (Destatis) on Friday, thus confirming its provisional estimate. Compared to the previous month, consumer prices in Europe’s largest economy were 0.4% higher. Energy prices contributed significantly to the increase as they surged 7.7% year-on-year with heating oil and motor fuel prices soaring 35.6% and 13%, respectively. Food prices climbed 2.8% compared to the same month in 2017, while services advanced 1.5%. Total goods prices were up by 3.1% in September. The harmonized index of consumer prices for Germany increased by 2.2% compared to September last year and gained 0.4% month-on-month. Stock markets in Europe opened with gains on Friday, breaking the shortlived downward trend that spiraled from the selloff on Wall Street. British Finance Minister Philip Hammond said earlier in the day that he feels more optimistic about Brexit negotiations now compared to a couple of weeks ago. However, he added, it would be “highly ambitious” to expect a deal right after the European Union summit in Brussels on Wednesday and Thursday next week. Meanwhile, the selloff of shares in the United States continued yesterday, as the Dow closed 500 points in the red, with the Nasdaq 100 and the S&P 500 recording sharp losses as well. Get access to my screens, live, here. When you’re logged in, you’ll see a live broadcast right here. 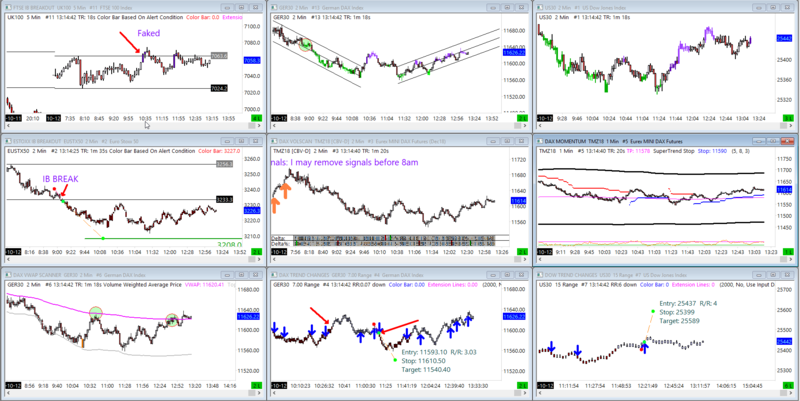 See the setups and signals for yourself, from any device at any time (when it’s broadcasting).